Chris Steele and Ruben Avila, otherwise known as NonToxic is an American Hardstyle duo from Los Angeles California, known for their innovative and exhilarating sound. Starting in late 2014, NonToxic has achieved so much in the American hard dance scene in such a short period of time. What started out as a couple of small time DJs in the underground scene has quickly evolved into a duo sharing the stage with some of the biggest names in hardstyle. However, no matter how far they go they still stay unique to their roots. The support for NonToxic has sky rocketed ever since Hard Dance Nation signed their original track “Fable” in January of 2016. They now receive tremendous support from companies such as Basscon, Insomniac Events, Rave Nation and more. Being booked at venues all over California such as, Exchange LA, Create Night Club, Avalon Hollywood, Florentine Gardens, DNA San Francisco, Rainbow Ballroom, The Belasco Theatre, and NOS Event Center, NonToxic continues to take the scene by storm playing events alongside some of the biggest names in hard dance music. such as Coone, DJ Stephanie, Zatox, Code Black, Gammer, Wasted Penguinz, Noisecontrollers, Angerfist, Wildstylez, DJ Isaac, Audiofreq, Da Tweekaz, Crisis Era and so many more. Now as they stand, they have been welcomed into the Harsh Records family. Releasing two brand new tracks “Fading Down” & “Blast” on their Debut EP “Evolve”. Joining other amazing American artists (Lady Faith, Mekanikal, Junkie Kid, Starx) in the hard music movement. 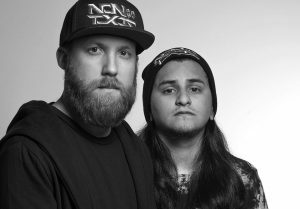 Day in and day out NonToxic share their passion for music with the hard dance community in hopes of being an inspiration to other artists, while being inspired by other producers that share similar interests. NonToxic regularly plays tracks by some of the biggest names in the hardstyle industry to show their appreciation and love for their peers, while continuing to strive towards bettering their production to create the new sounds of tomorrow, and to drive their momentum even further.